VPR’s Bob Kinzel was on hand for Town Meeting Day results in our special Town Meeting call-in program. He was joined in the studio by Steve Jeffrey of the Vermont League of Cities and Towns. Also on hand was John Nelson of the Vermont Superintendents Association to talk about trends in education spending. We heard the latest developments from reporters around the state including VPR’s John Dillon and Nina Keck. And you can hear it all by clicking on the Listen icon. nook and cranny to save money. will affect about 30 students. snow on the roof. And on Town Meeting Day, the heating system broke down. communities. Both votes were approved to fix the building. to have been his witty self. were apparently willing to give Louras the backing to continue his work. instant runoff voting. Kurt Wright, the Republican has come in second. for $350,000. He said town budgets are generally lower than last year. 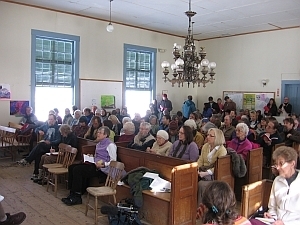 We learn about Switzerland’s 800-year-old Town Meeting tradition and check in with town meeting officers and participants for a look at how the institution is faring in Vermont. Check out some of these pics taken by VPR Staffers at meetings and polling places this morning. Organizers of a campaign to close Vermont Yankee nuclear plant say 33 towns voted in favor a measure urging state lawmakers to pull the plug on it. Nudists will be able to return to Lake Willoughby’s Southwest Cove this summer without worrying the town will demand they cover up.